Inner Sanctum ($0.89) Price History from major stores - Weatherlight - MTGPrice.com Values for Ebay, Amazon and hobby stores! 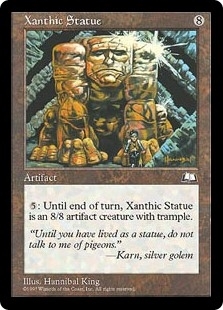 Card Text: Cumulative upkeep-Pay 2 life. (At the beginning of your upkeep, put an age counter on this permanent, then sacrifice it unless you pay its upkeep cost for each age counter on it.) Prevent all damage that would be dealt to creatures you control. 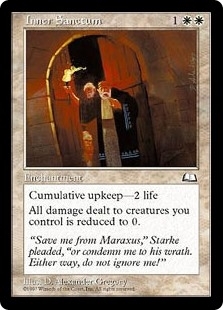 Flavor Text: "Save me from Maraxus," Starke pleaded, "or condemn me to his wrath. Either way, do not ignore me"